PASADENA, Calif. — A Martian dust storm that NASA’s Mars Reconnaissance Orbiter has been tracking since last week has also produced atmospheric changes detectable by rovers on Mars. 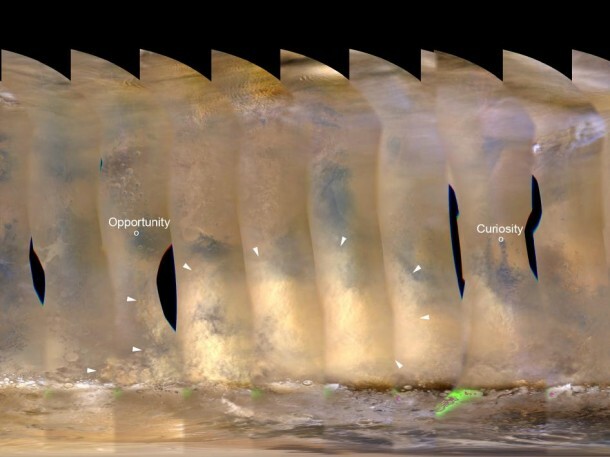 Using the orbiter’s Mars Color Imager, Bruce Cantor of Malin Space Science Systems, San Diego, began observing the storm on Nov. 10, and subsequently reported it to the team operating NASA’s Mars Exploration Rover Opportunity. The storm came no closer than about 837 miles (1,347 kilometers) from Opportunity, resulting in only a slight drop in atmospheric clarity over that rover, which does not have a weather station. Halfway around the planet from Opportunity, the NASA Mars rover Curiosity’s weather station has detected atmospheric changes related to the storm. Sensors on the Rover Environmental Monitoring Station (REMS), which was provided for Curiosity by Spain, have measured decreased air pressure and a slight rise in overnight low temperature. Curiosity’s equatorial location and the sensors on REMS, together with the daily global coverage provided by the Mars Reconnaissance Orbiter, provide new advantages compared with what Viking offered with its combination of orbiters and landers. “One thing we want to learn is why do some Martian dust storms get to this size and stop growing, while others this size keep growing and go global,” Zurek said. Besides the research value in better understanding storm behavior, monitoring the storm is also important for Mars rover operations. If the storm were to go global, the Opportunity rover would be affected most. More dust in the air or falling onto its solar panels would reduce the solar-powered rover’s energy supply for daily operations. Curiosity is powered by a radioisotope thermoelectric generator, rather than solar cells. The main effects of increased dust in the air at its site would be haze in images and increased air temperature. JPL, a division of the California Institute of Technology, Pasadena, manages the Mars Reconnaissance Orbiter Project and both of the Mars rover projects for NASA’s Science Mission Directorate, Washington.